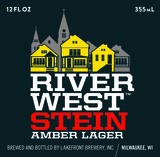 Our flagship beer named after the hardworking neighborhood in which Lakefront Brewery was founded. The rich amber color and smooth flavor are derived from the generous amount of caramel malt , with just a dash of roasted unmalted barley for a subtle toasted flavor in the background. The sweetness, body, and mouth feel tell you this is an all-malt beer. The finish has a balanced hoppiness which cuts through the malty character, leaving a clean palate which beckons for more.